This is a newly created and exciting job opportunity. We are looking to recruit a Head of Technical Underwriting for our client who is one of the fast growing and reputable insurance business in the UK. The Head of Technical Underwriting will be responsible for the management and KPI setting for up to 10 staff within their highly motivated and technically focussed personal lines underwriting team. 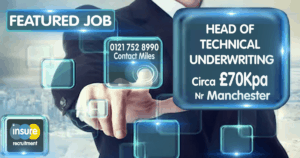 A proven track record of KPI setting, technical personal lines underwriting experience is required, the successful applicant will also be confident with SQL/data manipulation, pricing and MI reporting. Please contact Miles for further information his direct line is 0121752 8990.